Posted: Sat Jan 12, 2019 12:41 pm Post subject: What price did the 993 bottom out at? £11k It must have been very high mileage and/or very tatty. I was seriously in the market for a 911 in 2008 and 993s were at their lowest values. I didn't see any non-Cat cars advertised for under £20k. Most sensible mileage dealer cars were £22k+, about the same as late Gen1 996s and early Gen2 996s, so I'm assuming that they were trading at about £18k. Obviously high mileage cars would have been worth less but even so ........ £11k. .......and he traded it in for a 996. I'm happy to be educated by anyone that was 'in the know' back then but my thoughts are that your mate's memory is playing tricks. He's sharp as knife, I doubt it. On the upside he acquired that private plate virtually free. At the time you could get a decent 993 coupe man, with around 80k miles for early £20's, and decent turbos were mid to late £40s. A ropey cat d trip could be had for £8k. I bought Aug 2010 and prices were as low as I'd seen. Northway were looking for about £16-£17k for a decent 100k mile 993, and I bought mine for less! When I started researching buying my first 911 in late 2009 / early 2010 the 993 range were mid to late £20’s for decent cars with average mileages. I test drove a 993 and concluded, similar to the driver at the start of the P’Heads thread that the 996 was the one to go for. Lighter, faster, more usable as a daily driver. My view hasn’t changed. Alex, £11k seems low, but 2008 was the start of the financial crash so it’s plausible his timing was just lousy. Though if he got as good a price on what he changed for then that’s all that matters. What did he swap it for and what did he pay for that? 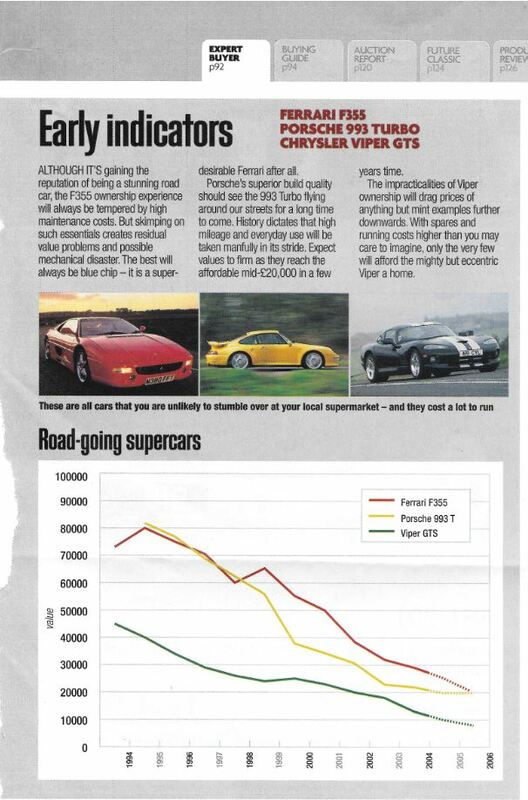 In 2005 you could pick up a 964 for 10k and a 993 was not much more. As ever the best cars even then as a percentage were significantly more. I know it was a Gen 1 996 but that's about it. I'll ask him when I see him. He had an 80's 911 before the 993. Another mate (Francis) was the buyer. He only kept it a couple of months and moved it on. Hated the suspension mod they'd done on it. Besides the suspension, what did he think of the quality of Eds work? The most amazing price one I remember seeing advertised was the Vesuvius C2S at £16,950. 205,000 miles but well cared for. Seller had a queue of buyers. Buyer relisted it three weeks later for £27k. Started reading the PH thread quoted above, with some interesting points about the 993 versus 996 which remain topical. One of the arguments being the 993 is the more economical car to run. Whoever wrote that had clearly not had bills like mine . Also the guy who was going on about how bad 993s are to drive until someone asked him how long he had owned one. Turns out he had driven one belonging to a friend once. Allegedly. Got to love some threads. Stopped reading it when I saw the cmoose posts one after the other and remembered why I've stopped using PH. When I was looking for a 911 in 2010 I had the choice of 964, could be had for around £12k, 993 and 996 and they were both available for under £20k which was my budget at the time, I opted for the better, more modern car. I paid £24k for the '996.2 with 45k miles - and ran it for 3 years. I then went on to buy a '993 in 2012 (C2 with 82k miles) for £20k and that was about the average price at that time.